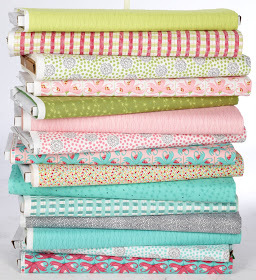 Fellow Australian, Sarah Fielke has just released a new fabric collection for Spotlight called – On the Pond. Scattered through the 15 pieces are 5 designs in 3 colour ways – pink, lime and turquoise and a hint of Black and White. Be sure to read Sarah’ post on the upcoming Spotlight Free Mystery Block of the month starting 1st February 2013 and share in Sarah’s cute projects and tutorials using her new collection. To be released January 2013. Already spotted in NSW at Spotlight in yardage and individual FQ’s. Thanks for sharing this. I don't often go into Spotlight but I will and I'll look out for it.